There is a strange story at the center of Michigan's cannabis culture. In 1972, there was a 22-day period where marijuana was technically legal due to the efforts of Michigan's cannabis advocates such as John Sinclair and his group of radical activists. It's a story that has been celebrated by Lansing State Journal, Detroit News, and Civilized in recent years. In researching the time period, Weedmaps News contributor Adam Woodhead uncovered one missing link that led to another, potentially challenging the conventional wisdom of Michigan's story of weed. This is what he found. It's the ultimate '70s stoner cliché — an entire decade that no one can remember. But what if cannabis was legal and everyone … just forgot? The story goes like this: On April 17, 1967, John Sinclair was arrested during a raid on the Detroit Artists' Workshop, near the Wayne State University campus. In Sinclair's book, “Guitar Army,” he notes that the space was used as an organizing hub for LeMar (“Legalize marijuana”), one of the first groups dedicated to campaigning for legal cannabis. It was his third arrest for possession of pot, and on July 28, 1969, he was sentenced to 9 ½ to 10 years in prison. But an intense campaign by his friends and allies drew the world's attention to his cause. John Lennon appeared at the John Sinclair Freedom Rally on December 10, 1971, and three days later Sinclair was released on appeal bond. Then on March 9, 1972, his case was brought before the Michigan Supreme Court. The court held that Sinclair's sentence was cruel and unusual, that he had been entrapped, and crucially, that cannabis was non-narcotic — and the 1952 bill that categorized it as such was unconstitutional. A new marijuana law was passed in its place, which would not go into effect until April 1, 1972, leaving the state without any laws punishing possession. Thus, the story goes: Marijuana was legal in Michigan for 22 days between March 9 and April 1, 1972. The New York Times did not report on the case until March 12, 1972, when it ran an article titled “Freed Poet Hails Michigan Ruling,” including a small picture of Sinclair, on Page 35. It outlined the basic facts of the case and ruling, emphasizing Michigan Supreme Court Justice John B. Swainson's argument that Sinclair had been entrapped. It closed with a quote from Sinclair, who said that while the new state law was relatively liberal, temporary legalization would have an important “psychological effect” in reminding cannabis users of how truly repressive prohibition was, no matter how lenient the new sentencing guidelines were. For its March 17 issue, the underground paper the Los Angeles Free Press ran a bold front-page article declaring that weed was now legal in Michigan. But the language in mainstream news outlets was more nuanced. 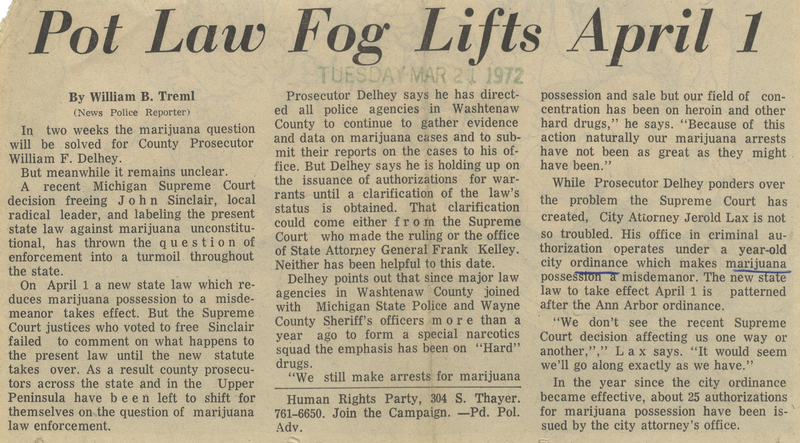 The Ann Arbor News ran a report on March 21 saying prosecutors across the state was in a state of “fog.” Authorities in Washtenaw County, where Ann Arbor is the county seat, continued to gather evidence in marijuana cases, but stopped just short of issuing warrants. If Marijuana Was Legal, Why Doesn't Anyone Remember? Larry Gabriel is a contributing editor to the Detroit Metro Times, where Sinclair is also an alumnus, and the author of the weekly column “Higher Ground.” In 1972, he was a freshman at Michigan State University in Lansing, the capital, and was in Ann Arbor for the Sinclair Freedom Rally, where he came home with an original event poster. Gabriel said he smoked weed at the time, but has no memory of it ever being legal. “Paul Walker,” the pseudonymous editor of Fifth Estate, an underground newspaper which began publishing in Detroit in 1965, had similar recollections of the period as a non-event. “We just kept smoking dope like we always had,” he wrote. Even some of Sinclair's close political allies have fuzzy memories of the specific period. Former Ann Arbor City Councilman Jerry DeGrieck was a member of the Human Rights Party, a local coalition that included Sinclair's group the Rainbow People's Party. The RPP emerged from the dissolution of the more militant White Panther Party, and a desire by Sinclair and others to humanize politics and de-escalate their radicalism. DeGrieck sat on the City Council around the time of People vs. Sinclair, but says his more distinct memories are of the struggle to pass Ann Arbor's $5 possession penalty, despite fierce opposition. DeGrieck also notes that the group's stance on cannabis legalization saw it as part of a broader set of important struggles, which included opposition to the war in Vietnam, and rights for gay and transgender communities. DeGrieck and his colleague Nancy Wechsler were two of the first openly gay and lesbian politicians in the United States. “It seems clear that the court did not intend for marijuana to be legal for that 22-day period and being aware that opportunists may misconstrue its decision, went as far as specifically directing law enforcement to apply M.C.L.A. 335.106; M.S.A. s 18.1106 [which prohibited drugs with hallucinogenic properties] to marijuana until April 1st, 1972,” Jacque wrote in an email. He says that to test the theory, one would have to go back through the arrest records from the period to look at successful or failed prosecutions. One of the best descriptions of how people in 1970s Ann Arbor were smoking weed in the pages of “Fugitive Days,” the memoir of ex-Weather Underground leader and emeritus Distinguished Professor of Education and Senior Scholar at the University of Illinois at Chicago, William Ayers. He said that offering someone a joint in those days was like offering them a cup of coffee — even the squares and frat boys in Ann Arbor were smoking.